If you’re an athlete and you are worried about what you’ll do when it is off-season, fret not because the CycleOps Fluid 2 Trainer is an amazing way to maintain your legs and keep them in shape. This trainer helps you to keep your legs in perfect condition making sure that you do not lose the agility when you’re not in season mode. The CycleOps Fluid 2 Trainer provides the best performance that a cyclist anywhere around the world demands. If you want to experience training like the real world, then the Fluid indoor trainer is your ultimate redemption. It really serves as a relief for trainers who fear that during off-season they might get out of shape and practice. The trainer has been smartly designed by its engineers who have made sure that the users get real life feel of training outside. The CycleOps is the best way in town to keep you in tiptop condition even when it is off-season. The large flywheel ensures that the user gets a road-like feel because of the double inertia produced by it. It has a power band technology which offers a much wider range of resistance. As you increase the speed, the wattage increases with it because of the infinite resistance curves. The trainer comes with a self-cooling mechanism which ensures that the unit keeps performing longer and better. The CycleOps fluid 2 trainer is very quiet and does not become a nuisance for others at home.The CycleOps fluid 2 trainer is made by a reputable companyThe power band technology ensures that the resistance range is wide from high to low.It comes with a DVD which has all the tutorials and guides you would need to understand the working of the trainer.The Power Training System gives you realistic statistical analysis which is produced at the end of your work out. These readings provide you with performance assessments and you can plan your future work outs based on the results. 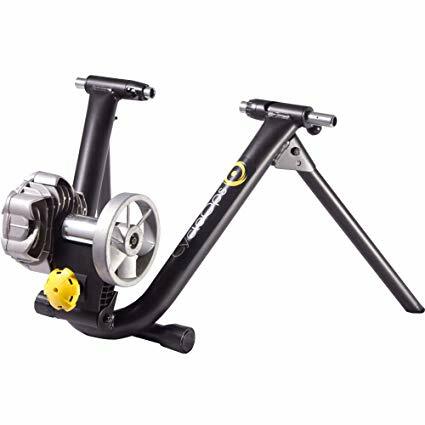 A few customers have trouble with the assembly instructions… You can find some assembly insturctions on this website, and customer service is willing to helpOne frequent critic that the CycleOps Fluid 2 Trainer has is the high price. Riders looking for a realistic road-like feel. Cyclists who want a quiet trainer. Cyclists wanting to buy a trainer from a rock-solid company that will last years of abuse!